Ever tried to use an Internet Search Engine to track down a song that you half-remember hearing once at a great halloween fancy dress party about five or six years ago? Chances are you didn’t meet with much success – typing a description of how the song sounded is likely to lead you down some very dark Web alleys indeed. The release of the game Guitar Hero II seems to have been greeted with enthusiasm by a wide range of musically-oriented individuals; Joseph Pisano gives it a review on his blog, and is impressed by its addictive rockability. Rafael Mizrahi and Tal Chalozin have taken their interest to another level by creating a headless android that can play the game for you. The Moscow Laptop Cyber Orchestra, or CybOrk, is a collective dedicated to exploring and expanding the possibilities of live interaction between musicians using a variety of electronic systems and controllers. Having just celebrated its first anniversary, the project features a core group of regular performers, with additional collaborators and guest contributors frequently getting involved. Although the performers do use a lot of pre-sequenced/recorded material, the live performances are more interactive and dynamic than the average laptop concert. In fact, the performance is treated like a sort of philharmonic cyber-jam – live sessions are recorded acoustically, as if each musician was playing a traditional instrument within an orchestra. Samples of their performances are available in mp3 format on the Cyber Orchestra website. The decline of CD sales worldwide has the music industry shipping water in a well-rocked boat; how the big fish decide to deal with current sea-changes in the public’s consumption of music will ultimately determine if they sink or swim. At the moment, brick-and-mortar music retail stores are swimming like… well, bricks. Sales of compact discs in the US for the first three months of 2007 were 20% lower than the same period last year; that’s 89 million CDs in Q1 2007 compared to 112 million in Q1 2006. In the UK, the British Phonographic Society reported that sales fell by 10% in the first half of this year. Furthermore, the entry of supermarkets into the fray has scuppered the profitability of many dedicated stores. In 2000, there were 967 independent outlets in the UK – this has now fallen to 687. Although it is not essential that an electronic musician be able to read sheet music, such an ability is a great advantage – particularly when creating music for film or TV. In fact, the more comprehensive your understanding of music is, the more sophisticated your work can potentially become. Modern music software gives everyone the chance to sit down, tweak a few filters, scatter a few notes in a matrix and drum up a new tune in a very short time; however, the detailed application of knowledge and experience is what makes raw ideas listenable and interesting. How Many CDs Do You Need To Get To The Moon? Only a decade ago, data storage capacities for a typical home computer were measured in Megabytes. Nowadays a typical hard drive capacity is hundreds of Gigabytes, and the newest models are breaching the Terabyte range. Considering the rate at which we are moving up through our storage nomenclature, how long will it be before our current list of denominations becomes inadequate? The Podcomplex DAW Guide has just been updated, and now includes a section on the physics of audio. This is an introduction to the basic science of sound, and will be expanding to deal with the topic in more detail over the coming weeks. 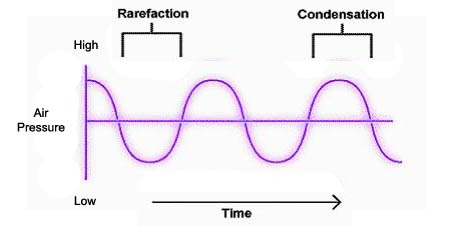 Covered in this section are definitions and explanations of wavelength, frequency and amplitude, as well as illustrations of the behavior and properties of sound waves. The decibel scale of loudness measurement is introduced, as are interference phenomena such as constructive/destructive interference (cancellation/reinforcement) and beat generation. Although such knowledge is not essential for most musicians, it is important for recording and mastering engineers to have a firm grasp of what they are dealing with; the more they know about how sound behaves, the better they can manipulate it to achieve a desired effect. As such, anyone who wants to set up microphones for recording, intends mixing or mastering audio in their home studio, or is just plain curious, should take the time to learn as much as they can about the properties of sound. So why not start right here? Although the music landscape has changed considerably over the past few years, creating and packaging a good demo can still be an important part of a new artist’s promotional campaign. A demo used to be seen as bait for a major label recording contract; however, although this may still be the intention of many bands, the process should now be viewed in a broader light. Considering the range of easily-accessible distribution models available to contemporary artists, a demo can be targeted to attract interest from many diverse areas: musical collaborators, a film or TV scoring project, advertising jingles, net label backing, online or print reviews… as well as traditional labels. However, the most important thing here is that the demo is targeted correctly. A list-making frenzy seems to be gripping the online music world; from a humble enumeration of 17 music distribution portals, to the mighty compendium of Music 2.0, we now are treated to 90+ essential sites as so deemed by Mashable. Well why not? In truth, this is a good source of browsage for a rainy afternoon – plenty of places where one can listen to music, sell music, jam along with other musicians, remix, karaoke, find artist info, discover song lyrics, and so on. Down in the nether reaches of the list you will find some audio conversion tools, one of which converts text to audio. If you’re looking for some sample inspiration, FindSounds may be of particular interest – here you can search through a database of audio samples, and filter the results by file format, bit resolution, sample rate and file size.